This research focuses on the developmental benefits of large scale transnational land acquisition in Ethiopia with specific reference to two corporations in Bako, in Oromia Region and Gambella Regions. In conjuncture, the magnitude of the business in Ethiopia and both the governments and corporations interest from this business especially after the 2008 economic crisis was studied. To assess these factors, a qualitative study was employed. Hitherto, Ethiopia has been increasingly providing 3 – 5 million hectares of agricultural lands for foreign investors. Since 2007 including medium size agricultural projects, about 2000 foreign corporations have secured farm land. In Bako and Gambella 25% and 30% of the arable and total land area have been provided to TNCs, respectively, with quite nominal lease price per year that ranges between $ 2 and 10. This is the lowest in Africa. Increasing soil pres-sure, displacement of local population from their livelihoods, conflict over land resources, loss of wild life and forest cover are the major risks of the business. From the findings, the federal government attracts corporations mainly to acquire foreign currency, followed by gaining financial and political freedom from foreign aid. Expected developmental benefits in terms of tech nology transfer, infrastructure development, employment creation and market linkage, have found to be very weak and inexistence. This is partly due to lack of legal and institutional framework which enforces these benefits. Evidence also shows competition on land provision between the federal and regional governments. As a result, actual land delivery and on records are dissimilar. It is the researcher’s contention that macro-economic benefits like the need for foreign currency should not override local communities’ interest and livelihood. Rather the government should focus on forming sustainable developmental linkage with TNCs rather stimulating enclave formation. 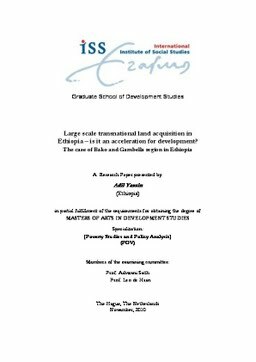 -- Relevance to Development Studies -- The study is conducted on the current debating issue of large scale agrarian land acquisition in Ethiopia. Despite the spate of media reports and some published research, international land deals and their impacts remain vaguely understood. This study will contribute to further policy and academic debates for researchers, students and international organizations dealing with this issue. It highlights how countries like Ethiopia are affected by the global economic process in relation to land acquisition. Conclusions drawn from this study could help inform policy makers to evaluate the cost of these deals and the envisaged benefits.